Los seis pescadores tienen una rotación diaria. Cada pescador tiene su propia moneda. Pescamigo cuya reputación en "Mejor Amigo" es necesaria para completar el logro Camarada de los pescadores de las islas y cuya recompensa es la Esmeralda de Sondaluz que otorga un conjunto de colores al arma de artefacto de pesca Caña Sondaluz. - Cajón de corchos: corcho encantado por 2 monedas de oro y 20 monedas de plata, siendo "Mejor amigo"
Es importante mencionar que los objetos que piden 50 monedas, también requieren tener la reputación de "Buen amigo", los que piden 100 necesitan ser "Mejor amigo". En acuerdo con el comentario en inglés del usuario BuGs11, se puede crear un grupo y obtener las monedas más fácil. She is a ghostly night elf figure at the location 43, 40. Which is water north of the Illidari Stand. Look for a canoe and some barrels. She functions much like Conjurador Margoss, in that you fish up a currency which gives you reputation with her when you hand it in. Standing near her will give you the buff Por la boca muere el pez, allowing you to fish up Encantamiento fragmentado. Once in a while you may also fish up a Punta de lanza Espiral de Odio which will summon a Espíritu Espiral de Odio. Kill the spirit and for a while your chance to catch Encantamiento fragmentado will be greatly increased for all nearby players, so doing this with a group is beneficial. ◾Ilyssia of the Waters should no longer appear in Azsuna. She wasn't quite ready for her debut yet. She is back 7.3, and has brought the other 5 fishermen for Camarada de los pescadores de las islas. Only one is up at a time. Each Encantamiento fragmentado is currently worth 50 reputation. My guess is these rotate weekly or bi-weekly, like archaeology quests. It would make sense to funnel the fishing raids into one spot so it's not a bunch of small raids fishing inefficiently everywhere. Using this script can help you keep track of how many more fragments you have to collect to get to best friend. It is macro friendly, so feel free to put it on your bars to check once in a while. If you are farming this faction you can track how many Encantamiento fragmentado you need to be "Best Friend" with the following macro this also takes 10% rep buff into account. 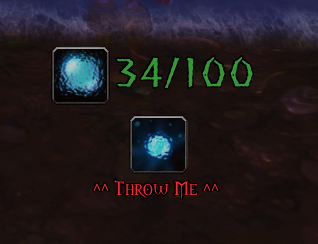 I wrote a small WeakAura for the Broken Shore fishing factions. Whenever you catch one of the rep/currency items it'll display a small popup for 4 seconds showing your current count (plus any in bank). It's set to only show once you have 80+ and a sound alert will play once you have 96+. It'll also alert you with a sound and display a persistent clickable button when you catch one of the items that spawns the mini-boss. This will only show while you have a fishing rod equipped. All sounds can be changed or disabled and thresholds for when to start showing can also be changed (or set it always show). The aura itself will only load on characters that have learned the Fishing ability. Since the WeakAura import string is quite long I've posted it below on pastebin. All updates to the aura are also noted in the above pastebin link. Just posting to say I do not see her at 43.40, the boat and barrels still there. Shes not there for me. With 6 Fishing Masters of the Broken Isles I expect them to sell all 18 rare baits for Pezqueñines no, gracias, the open water baits maybe put into Impus' store (Broken Shore). You get the buff Por la boca muere el pez at "her" pond, so maybe at the other fishers' locations too. First spotted July 12. Gone when I checked July 13. The six fishermen have a daily rotation. Each fisherman has his own coin. Full information on all Fisherfriends can be found in my guide Legion Fishing Guide (Patch 7.3). Turning in reputation items will give 75 per item, which means you need to turn in 530 to get maximum reputation and 680 to buy all the items. Fisherfriends sell different items: fish, lures, pets, bobbers, shirts, and toys. Please note, turning in reputation items will take all reputation items in your bags. Getting maximum reputation with all the Fisherfriends will award Camarada de los pescadores de las islas and unlock a color variant of the fishing artifact weapon. Below is a list of all items they sell, and below that is a list of all Fisherfriends. All fishing locations are close to the Fisherfriend. You will have the Por la boca muere el pez buff when at the right spot. Based on my experience so far, each Fisherfriend is basically like Margoss, only they take about 2-3 hours in a raid to reach Best Friend and purchase all unique items from. Each turnin item gives 75 rep instead of 50, there are bosses to summon just like the elemental that will make every catch give you the turnin, while the buff is active you fish up 3-4 of the turnin instead of only 1-2, and each fisherfriend has fewer and cheaper items. You need to be close enough to the fisherfriend to have the Por la boca muere el pez buff to catch the turnin or boss summoner. The boss's health goes up the more people hit it, but it does still seem to be more efficient to have as many people fighting as possible. Warning! When you turn in items for rep, the fisherfriend will take ALL of them, even if you are at max reputation already! Be very careful when near/at Best Friend. There are six fisherfriends, and they rotate daily. So far there doesn't seem to be a way to tell which one is up besides looking for yourself or checking custom groups. Each fisherfriend is associated with one fishing area (the five zones and the ocean) and sells the fish for their area (10 for 10), each special bait for their area (25 each), a fishing bobber toy (100, Best Friend), and one other item (generally 50, Good Friend). Reaching Best Friend with all six grants Camarada de los pescadores de las islas, which gives Esmeralda de Sondaluz, unlocking new tints for Caña Sondaluz. Guardiana Raynae in Val'sharah (53.41, 72.86) at Lorlathil sells Receta: Festín de pescados and Cajón de corchos: rostro del bosque. Akule Cuerno de Río in Highmountain (32.62, 40.80) by Thunder Totem sells Tótem de pesca de arrastre and Cajón de corchos: tótem flotante. Corbyn in Stormheim (90.69, 10.87) at Shield's Rest sells Baliza de Corbyn and Cajón de corchos: yelmo de madera tallado. Sha'leth in Suramar (50.71, 49.34) sells Koi con escamas Ley (cost = 5 each) and Cajón de corchos: réplica de góndola. I will update this as new information comes out. Even with patch 7.3, I cannot find her. Guess we still have to wait a bit. Remember to talk to her before you start fishing. Talking to Ilyssia will give you "stranger" reputation and you will start catching Fragmented Enchantment. Ilyssia's fishing buff area extends to the opposite side of the pond as well, making it fairly roomy. She is up today 02 March 2018. For Camarada de los pescadores de las islas you need to obtain "Best Friend" level of Reputation with six fisherfriends. It takes 42,000 rep to get all the way to Best Friend, via 5 No levels of 8,400 each. The rep items award 75 rep each so a total of 530 No rep items are needed. If you're human, which gives humano, OR have any other 10% buff, such as ¡WIII! from the Darkmoon Fayre you get 82.5 rep each, so need only 510 No. With humano, AND any other 10% buff, e.g. ¡WIII! you get 90 rep each so need only 467 No. With both humano and ¡WIII! and in a large raid group, I reach Best Friend in just under one hour. To obtain rep with each fisherfriend you fish up rep items, different for each fisherfriend, in the waters adjacent to each fisherfriend. You know you're in the right area because you'll get the buff Por la boca muere el pez. These items are also used to purchase toys; you can only have 100 of any of the rep items in your bag. WARNING - When you turn in items for rep they will ALL be accepted, not just enough to max your rep.
Hand in Adorno lustroso to the NPC Corbyn in Tormenheim for 75 / 82.5 / 90 rep with the faction Corbyn. Hand in Pezqueñín dorado to the NPC Sha'leth in Suramar for 75 / 82.5 / 90 rep with the faction Sha'leth. Hand in Algas profanadas to the NPC Diablillus in Costa Abrupta for 75 / 82.5 / 90 rep with the faction Diablillus. Hand in Encantamiento fragmentado to the NPC Ilyssia de las Aguas in Azsuna for 75 / 82.5 / 90 rep with the faction Ilyssia de las Aguas. Hand in Glóbulo corrupto to the NPC Guardiana Raynae in Val'sharah for 75 / 82.5 / 90 rep with the faction Guardiana Raynae. Hand in Fragmento de tótem antiguo to the NPC Akule Cuerno de Río in Monte Alto for 75 / 82.5 / 90 rep with the faction Akule Cuerno de Río. This will go a LOT faster if you are in a raid group, because for each fisherfriend area there's an item that can be fished up which is thrown back to attract a mob who provides a buff that provides extra rep items for a few minutes after it's been killed. By the way, the error message on upgrading your artifact Underlight Angler is incorrect. You add traits at the pearl above Dalaran fountain, not the artifact forge at your class hall. When saving up totem fragments to purchase the bobber and pet be careful you don't end up giving her all your fragments because you've been doing that for the past few hours. Blizzard didn't have the common sense to prevent you from wasting fragments for rep when already at max level. Also don't forget the max rep currency for each fisherfriend has a max held limit of 100 so you don't waste time. Azsuna - 43.40 - The pool on the right North-West up the road just pass Illidari Stand. If she is up (main page of WoWhead will tell you) she is next to the boat and barrels. Drag the macro icons to an action bar. The icons for the tool tips will be the default red question mark until you make your first catch. Then the icon will change to the inventory icon with the count. When you turn in Encantamiento fragmentados or summon the Espíritu Espiral de Odio using the Punta de lanza Espiral de Odio, the count will go to zero but the icon will remain. If you're solo fishing when Por la boca muere el pez is up, it's really useful to know whether you've caught a Punta de lanza Espiral de Odio because you can only have one in your inventory at a time. Open the Game Menu (icon with red question mark). Create Macros window opens. Click New button. Do not select an icon! Click Okay. The icon window closes. Be sure to leave a space after #showtooltip. Then enter the exact name of the item. Click Save and drag icon to your action bar. Click Exit. As soon as you catch a Encantamiento fragmentado, the icon (with count) will replace the default icon. If you turn in Encantamiento fragmentados, the icon will remain and the count will go to zero. Exchange Maná ahogado for Cebo Arcanos. Keep Cebo Arcano up to increase your chance of catching bait that attracts rare Azsuna fish. La antigua vigilante del Estanque Real de Azsuna.